• Epoxy resins will adhere to any clean, dry materials including metal, wood, stone, concrete, paper or canvas -all work well. They provide surfaces with a clean and regular shape that makes them perfect for creative tables and floors. • Epoxy resins are extremely strong and durable, very suitable to withstand shape-shifting processes needed in sculpting or carving at both high and low temperatures. If a particular work of art using epoxy does not make it to the annals of art history, it will not be because of deterioration. • Epoxy resins can be invisible and therefore will not ruin any masterpiece. 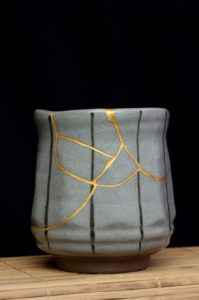 They can be blended with paint and be colourful too: for example, the Japanese “Kintsugi” technique combines epoxies and gold to repair cracked objects to give them “a second life”. 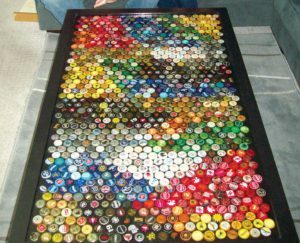 Many artists have started to include epoxies in their creations and in urban artwork. For example, Spanish artist Manolo Valdés has recently inaugurated a new set of sculptures in the Valencian City of Arts and Sciences. The sculptor used epoxy to give the statues an enameled look, similar to the plates of the ships when they were made of metal and then painted several times. Similarly, French artist Christiane Dumas started to use epoxy in her paintings after she used it to fix her broken surfboard with great results. These are only a few of the many examples where epoxies are helping beautifying our world. Who knows where we will “see” them in the future. Keep your eyes wide open!